Not to be confused with Taxi Driver. A Taxi Driver (Hangul: 택시운전사; Hanja: 택시運轉士; RR: Taeksi Unjeonsa) is a 2017 South Korean historical action drama film directed by Jang Hoon, with Song Kang-ho starring in the title role, alongside Thomas Kretschmann. The film centers on a taxi driver from Seoul, who unintentionally becomes involved in the events of the Gwangju Democratization Movement in 1980. The film was released on August 2, 2017, in South Korea. It was selected as the South Korean entry for the Best Foreign Language Film at the 90th Academy Awards, but it was not nominated. The film was a commercial success, and was also the second highest grossing film of 2017. In 1980, Kim Man-seob is a widowed father who works as a taxi driver in Seoul. One day, he overhears another taxi driver talking about a foreign client who has booked him for a trip worth 100,000 won; the client intends to travel to Gwangju for the day and return to Seoul before curfew. Man-seob rushes off to steal the client. The client is Jürgen "Peter" Hinzpeter, a German journalist who wishes to report on the increasing civil unrest in Gwangju. Due to strict censorship, foreign reporters are prohibited from entering the country. Peter pretends to be a missionary in order to enter South Korea. Man-seob meets Peter and lures him into his taxi before heading off to Gwangju. The two men discover that all the roads leading to Gwangju are blocked and heavily guarded by soldiers. Man-seob tries to convince Peter that they should return to Seoul, but the latter refuses to pay the 100,000 won unless they reach Gwangju. They manage to enter the city after they lie about Peter being a businessman. In Gwangju, they find that all the shops are closed and the streets are deserted. Man-Seob dismisses the severity of the city's state as he believes that the recent riots were caused by students who only "go to school to protest". Peter begins to record his observations on his camera, and the two men meet a group of college students who are riding on a pickup truck. The leader of the group, Yong-pyo, invites Peter aboard. They also befriend English-speaking student, Jae-sik. Man-seob decides to turn back, reluctant to have his taxi damaged in the riots. Along the way, he takes pity on an old woman looking for her son and she leads him to the local hospital. The woman's son turns out to be Yong-pyo, who is in the hospital with minor injuries. Peter and the college students scold Man-seob for his selfishness and refuse to let Peter pay him until he fulfills the agreed trip. Man-seob agrees to take Peter and Jae-sik (now acting as translator) through Gwangju. Local protesters welcome the foreign reporter and greet the trio with food and gifts. Peter films violent riots and witnesses soldiers beating protesters. Plainclothed Defense Security Command (DSC) officers see him filming and move to arrest him. The three men evade capture. That evening, Man-seob's taxi breaks down and they are met by Tae-soo, one of the local taxi drivers. Tae-soo tows the taxi to his shop for overnight repair. Man-seob becomes distressed as his young daughter is home alone and he is unable to contact her as Gwangju's phone lines have been cut. Tae-soo lets the men stay at his house for the night. During dinner, they hear an explosion and discover that the television station has been bombed. They head there and Peter films the turmoil. The officers recognize Peter and chase the three men; Jae-sik is captured, but before he is taken away, he yells for Peter to share the footage with the world. Man-seob is assaulted by the leader of the DSC, who accuses the driver of being a communist. Peter rescues Man-seob and the pair run back to Tae-soo's house. At dawn, Tae-soo gives Man-seob fake Gwangju license plates as the soldiers are now searching for a Seoul taxi. Alone, Man-seob drives to the nearby town of Suncheon, where he overhears reports of the events in Gwangju; the media falsely claims that the chaos was caused by "rogue groups and rioters". He is overwhelmed with guilt and drives back to the hospital in Gwangju to find Peter in shock and Tae-soo crying over Jae-sik's corpse. He reminds Peter of his promise to show the world what is happening in South Korea and encourages him to continue filming. They film a street where soldiers are mercilessly shooting at civilians. Man-seob and the other taxi drivers use their vehicles to barricade the soldiers from further harming the civilians. The soldiers continue shooting, and the two men arrive at a road blocked by soldiers. Man-seob states that he is taking a foreign businessman away from the turmoil. A young soldier searches the car and finds the license plates from Seoul. However, he remains silent on the discovery and lets them go. The soldiers then receive orders not to let any foreigners out, prompting them to chase the duo and shoot at them. The pair are rescued by the local taxi drivers, who ram into the military vehicles to distract the soldiers. The taxi drivers are presumably killed in the chase, and Tae-soo ultimately sacrifices himself to allow Man-seob and Peter to escape. The two men make it to the airport, where they bid each other an emotional farewell. Peter asks Man-seob for his name and phone number as he wishes to return to South Korea to visit. Man-seob hesitates but then writes his name and phone number in Peter's notebook. Peter leaves the country safely. Peter shares the footage with his superiors and the news is spread all over the world. He searches for "Kim Sa-bok", only to be told that the latter had provided a false name and phone number. In Seoul, Man-seob happily reunites with his daughter. 23 years later, Peter receives an award in South Korea for his report on the Gwangju Uprising. In his speech, he expresses his gratitude to "Kim Sa-bok" and hopes to see him again someday. Man-seob, still a taxi driver, reads a newspaper article about Peter's speech and achievements including his words of gratitude towards him. Man-seob then murmurs that he is more grateful to Peter and that he misses him too. The epilogue states that Peter tried to search for the taxi driver who took him through Gwangju, but he died in 2016 before they could meet again. The film ends with footage of the real Peter, who gives his thanks to "Kim Sa-bok". A widowed taxi driver who lives with his eleven year old daughter in a small house. He is an ordinary man from the working class who cares only about his family's livelihood and is uninterested in political issues. 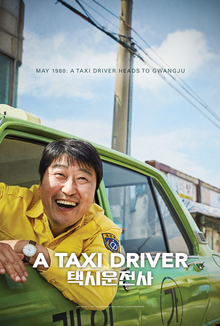 The character is loosely based on real-life taxi driver Kim Sa-bok, who ferried Jurgen Hinzpeter to Gwangju. Kim remained out of the public eye until the release of A Taxi Driver, when in September 2017, following the immense commercial and critical success of the film in South Korea, Kim's identity was finally confirmed by his son, Kim Seung-pil. The younger Kim shared with the media a photo of Jurgen Hinzpeter with his father and revealed that his father died of cancer in 1984, four years after the Gwangju events. A German reporter. The character is based on the life of Jürgen Hinzpeter (1937–2016), the late German journalist who filmed and reported on the Gwangju massacre. Filming began on June 5, 2016, and ended on October 24, 2016. The film was released on August 2, 2017 in South Korea. On the same day, the film had its international premiere at the Fantasia International Film Festival in Montreal, where Song Kang-ho was named Best Actor for his role in the film. According to distributor Showbox, the film will be released in North America on August 11, Australia and New Zealand on August 24, followed by the UK on August 25. It will then open in Asian countries including Hong Kong, Taiwan and Japan in September. Edeltraut Brahmstaedt, the widow of the German journalist Jürgen Hinzpeter, was to visit Seoul on August 8, 2017. During the visit, Brahmstaedt planned to watch the film based on the true story of her late husband. Maggie Lee of Variety wrote, "director Jang Hoon brings a sappy, feel-good touch to a tragic subject" and "Although the film’s portrayal of its main characters has recognizable precedents, the two lead actors calibrate their mutual respect and co-dependency to engaging effect, as the escalating violence and peril heighten their sense of personal mission. Echoing the role of American correspondent Sydney Schanberg in "The Killing Fields", Hinzpeter arrives in Korea as an opportunistic newshound rather than a champion of justice. Kretschmann plays him initially with an unlikable cold efficiency, treating his driver and other Koreans as mere tools or fodder for his article. Impressively, there are no overnight changes in his persona. Rather, the actor maintains a certain stiff composure even as his passion and affection for the democracy fighters visibly grows. The final parting is genuinely touching as the two men now relate to each other as equals." Sheri Linden of The Hollywood Reporter, in his positive review of the film, wrote, "In unexpected and wonderfully satisfying ways, A Taxi Driver taps into the symbiotic relationship between foreign correspondents and locals, particularly in times of crisis. Though filled with moments of taut suspense and quick action, Jang’s film is also rewardingly unrushed, a quality exemplified by an extended sequence in which the visitors from Seoul share a meal and an evening with Yoo’s Gwangju cabbie and his family. At once sincere, awkward and silly, their respite of calm and laughter amid the terror beautifully underscores the way ordinary lives are caught in the crosshairs of history." According to the Korean Film Council, on the first day of the release, a total of 698,090 tickets were sold, which earned US$4.5 million. The film was available on 1,446 screens and was shown 7,068 times across South Korea. By noon on the second day of its run, the film had passed the one million viewer mark. On the third day, the total audience doubled, attracting two million viewers. The viewer numbers continued to rise as the tickets sale increased to four million by the fourth day. A Taxi Driver has earned a total of US$30.7 million in five days with 4.38 million admissions. It has tied with The Admiral: Roaring Currents and The Battleship Island for the record of films which have surpassed four million viewers in the first five days of release. At the end of the first seven days, the film surpassed 5 million admissions. On the eleventh day since the opening the film recorded more than 7 million viewers. A Taxi Driver became the most viewed South Korean film in 2017 in less that two weeks since its premiere by attracting more than 8 million audience. By August 15, 2017, it has earned a total of US$62.7 million with 9.02 million admissions. By August 20, in just 19 days since the film was released, A Taxi Driver surpassed 10 million viewers selling 10,068,708 tickets, earning a total of US$73 million. A Taxi Driver also became the first film of 2017 and the fifteenth Korean film overall to surpass the 10 million milestone. It is also Song Kang-ho's third film to have sold more than 10 million tickets. The film topped the South Korean box office for three consecutive weekends. By August 28, the film had attracted 11.4 million viewers. According to the film's distributor Showbox, the total attendance of the film surpassed the 12 million mark as of September 9, becoming the tenth most-watched local film of all time in South Korea. A Taxi Driver is yet to be released in any form in Mainland China, though it received a theatrical release on September 21, 2017 in Hong Kong, a special administrative region of China. The film has received warm responses from users on Chinese movie website Douban, where it had a high user rating. However at around 21:10, October 3, 2017, the film was entirely removed from the Chinese movie portal, the reason possibly being that a number of reviews had compared the film's content to the June Fourth Incident, also known as the Tiananmen Square protest of 1989, which is strictly censored on media in China. ^ A Taxi Driver at Rotten Tomatoes. Retrieved January 21, 2019. ^ A Taxi Driver at Metacritic. Retrieved September 2, 2017. ^ ""영화 '택시운전사' 1973년식 브리사 택시 복원에만 7개월"". Yonhap News Agency. 16 July 2017. Retrieved 2 August 2017. ^ "Taeksi Woonjunsa". The Numbers. Retrieved 15 September 2017. ^ Herald, The Korea (3 May 2016). "Song Kang-ho to star in 'Taxi Driver'". Retrieved 23 February 2017. ^ "SONG Kang-ho Takes Lead in TAXI DRIVER Depicting the Gwangju Democratization Movement". Retrieved 23 February 2017. ^ "Big-budget movies to highlight 2017". Korea Times. 6 January 2017. Retrieved 23 February 2017. ^ "제90회 아카데미영화상 외국어영화부문 한국영화 출품작 선정 결과". 4 September 2017. Retrieved 4 September 2017. ^ Kil, Sonia (4 September 2017). "Korea Hails 'A Taxi Driver' For Oscar Race". Variety. Retrieved 4 September 2017. ^ Shim Sun-ah and Cho Jae-young (July 12, 2017). "(LEAD) (Yonhap Interview) Actor Song Kang-ho speaks about new film on Gwangju Uprising". Yonhap News Agency. Retrieved 2017-08-02. ^ Choe Sang-hun (August 2, 2017). "In South Korea, an Unsung Hero of History Gets His Due". The New York Times. Retrieved 2017-08-02. ^ Bae Seung-hoon (September 7, 2017). "Taxi driver's identity is confirmed". JoongAng Ilbo. Retrieved 2017-09-07. ^ "German actor Thomas Kretschmann to visit Korea to promote new film". Yonhap News Agency. July 17, 2017. Retrieved 2017-08-02. ^ "KOBIZ - Korean Film Biz Zone : in Production". Retrieved 23 February 2017. ^ Shim Sun-ah (2017-07-14). "(Movie Review) A Taxi Driver: Gwangju Uprising seen from eyes of outsiders". Yonhap News Agency. Retrieved 2 August 2017. ^ "'A Taxi Driver' to close Fantasia Film Festival". JoongAng Ilbo. 2017-07-07. Retrieved 4 August 2017. ^ "'A Taxi Driver': Review". Screendaily. 2017-08-01. Retrieved 4 August 2017. ^ "Song Kang-ho Wins Best Actor at Fantasia Film Fest". The Chosun Ilbo. 2017-08-04. Retrieved 4 August 2017. ^ "'A Taxi Driver' to open worldwide next month". Korea JoongAng Daily. 2017-07-18. Retrieved 2 August 2017. ^ "S. Korean Movie "A Taxi Driver" to be Released Internationally". KBS World Radio. 2017-07-17. Retrieved 2 August 2017. ^ Yun Suh-young (2017-07-31). "Widow of German reporter Jurgen Hinzpeter to visit Seoul". The Korea Times. Retrieved 2 August 2017. ^ "(LEAD) Moon watches movie about Gwangju uprising". Yonhap News Agency. 2017-08-13. Retrieved 15 August 2017. ^ "Moon Jae-in visits showing of 'A Taxi Driver'". JoongAng Ilbo. 2017-08-14. Retrieved 15 August 2017. ^ Kim Rahn (2017-08-14). "Presidents' choice of films shows political messages". The Korea Times. Retrieved 15 August 2017. ^ "Film Review: 'A Taxi Driver'". Variety. 2017-08-16. ^ "'A Taxi Driver': Film Review". Hollywood Reporter. 2017-08-11. ^ Jon Maala (2017-08-03). "Taxi Driver dislodges Battleship Island from top of Korean box office". International Business Times. Retrieved 4 August 2017. ^ "A Taxi Driver' dethrones 'The Battleship Island' on opening day". Yonhap News Agency. 2017-08-03. Retrieved 3 August 2017. ^ "'A Taxi Driver' tops 1 mln in attendance on 2nd day". Yonhap News Agency. 2017-08-03. Retrieved 4 August 2017. ^ "'A Taxi Driver' audience tops 2 mln by third day". Yonhap News Agency. 2017-08-04. Retrieved 7 August 2017. ^ "'A Taxi Driver' audience tops 3 mln by 4th day". Yonhap News Agency. 2017-08-05. Retrieved 7 August 2017. ^ Jo Ji Young (2017-08-06). "'택시운전사' 5일 만에 400만 돌파…'군함도'와 타이기록 (공식입장)" (in Korean). Sports Chosun. Retrieved 7 August 2017. ^ Sonia Kil (2017-08-07). "Korea Box Office: 'Taxi Driver' Revs Up Third-Biggest Opening of All Time". Variety. Retrieved 8 August 2017. ^ Shim Sun-ah (2017-08-07). "'A Taxi Driver' races to top weekend box office". Yonhap News Agency. Retrieved 8 August 2017. ^ "'A Taxi Driver' tops 5 mln on 7th day". The Korea Herald. 2017-08-08. Retrieved 10 August 2017. ^ "(LEAD) 'A Taxi Driver' tops 5 mln on 7th day". Yonhap News Agency. 2017-08-08. Retrieved 10 August 2017. ^ "'택시운전사' 700만 관객 돌파…올 영화 중 최단 기록" ['Taxi driver' surpasses 7 million viewers ... The shortest of all films] (in Korean). Star Financial News. 2017-08-12. Retrieved 14 August 2017. ^ "<택시운전사> 700만 관객 돌파, 올 개봉작 중 최단 기록" [<Taxi driver> 7 million passengers, the shortest of all releases] (in Korean). News Khan. 2017-08-12. Retrieved 14 August 2017. ^ "'A Taxi Driver' surpasses 8 mln in attendance, becoming most-viewed film this year". Yonhap News Agency. 2017-08-14. Retrieved 15 August 2017. ^ Lee Hyo-won (2017-08-14). "South Korea Box Office: Local Drama 'A Taxi Driver' Becomes Top Film of 2017". The Hollywood Reporter. Retrieved 15 August 2017. ^ Jonathan Hicap (2017-08-16). "Korean president watches hit movie 'A Taxi Driver'". Manila Bulletin. Retrieved 17 August 2017. ^ Jon Maala (2017-08-20). "'A Taxi Driver' sets box office record with 10 million audience". International Business Times. Retrieved 21 August 2017. ^ Jin Min-ji (2017-08-22). "[Korean Box Office] 'A Taxi Driver' speeds past 10 million ticket sales". Korea JoongAng Daily. Retrieved 22 August 2017. ^ Lee Mi-young (2017-08-20). "'택시운전사', 올해 첫 천만영화…장훈 감독 "뜻깊고 기뻐"" (in Korean). eNews24. Retrieved 21 August 2017. ^ Kim Jae-heun (2017-08-20). "'A Taxi Driver' attracts 10 million moviegoers; 15th Korean film in history". The Korea Times. Retrieved 21 August 2017. ^ Shim Sun-ah (2017-08-21). "Two Korean films sweep weekend box office". Yonhap News Agency. Retrieved 21 August 2017. ^ Jin Min-ji (2017-08-28). "[Korean Box Office] Star-studded 'V.I.P.' debuts strong despite criticism". Korea JoongAng Daily. Retrieved 29 August 2017. ^ "'A Taxi Driver' Draws 12 Million Viewers". KBS World Radio. 2017-09-10. Retrieved 12 September 2017. ^ Weibo (2017-10-01). "Reminder of June Fourth - A Taxi Driver getting censored in China". Apple Daily. Retrieved 1 October 2017. ^ "A Taxi Driver attracts Chinese audience, while the item was deleted on Douban". VOA. 2017-10-03. Retrieved 3 October 2017. ^ "A TAXI DRIVER Tops Buil Film Awards". Korean Film Biz Zone. October 17, 2017. ^ Hong Dam-young (2017-08-05). "Song Kang-ho of 'Taxi Driver' wins best actor award at Fantasia Film Fest". The Korea Herald. Retrieved 7 August 2017. ^ "54th Daejong Film Awards (Grand Bell Awards) 2017". HanCinema. 2017-09-29. ^ "THE FORTRESS Dominates 37th Korean Film Critics Association Awards". Korean Film Biz Zone. October 30, 2017. ^ "'제1회 더 서울어워즈' 노미네이트 공개, 이보영 지성 김희선 조승우 등 화려한 라인업 공개". Naver. 2017-09-28. ^ "'서울어워즈' 송강호·나문희·지성·박보영 주연상…·'박열'·'비숲' 대상[종합]". TV Report (in Korean). October 27, 2017. ^ "'택시운전사', 美 AWFF 3관왕 '쾌거'…아카데미 주목할까" (in Korean). News1. 2017-11-06. ^ Jon Maala (2017-11-07). "'A Taxi Driver' bags best film plum at Asian World Film Festival". International Business Times. ^ "[공식입장] '제38회 청룡영화상' 후보 공개, '불한당'vs'택시' 대격돌" (in Korean). Sports Chosun. 2017-11-06. ^ "[공식]봉준호·설경구·나문희, 디렉터스컷 어워즈 선정 '올해의 감독·배우상'". Chosun (in Korean). ^ "More top actor awards for Song, Na". Korea JoongAng Daily. December 13, 2017. ^ "제54회 백상예술대상, TV·영화 각 부문별 수상 후보자 공개". JTBC (in Korean). April 6, 2018. ^ "제23회 춘사영화제 5월18일 개최..홍상수·김민희 참석하나". Newsen (in Korean). May 3, 2018. This page was last edited on 23 March 2019, at 04:34 (UTC).